No doubt you must have heard severally about the almighty zoto recharge application that is giving huge cashback to customers. But if you have not still heard about this opportunity and you are in Nigeria, this is your chance to register and get cashback on every single recharge/ bill payment you make every day. What And Who Is Behind Zoto Recharge/ Bill Payment Application? Zoto is a CBN certified recharge and bill payment gateway, it was established in 2015 with a goal to build a safe, fast and easy recharge platform for Nigeria. The platform is available on iOS and Android and has become established as one of Nigeria’s best recharge solutions with a 4.5 star rating on the Play Store. Zoto has made mobile recharge recharge and bill payment more easier, safer, faster and above all fun, as you keep getting cashback on every transaction made. Just like every other VTU recharge, either from your banking mobile application, Internet banking or any other recharge application/ website, zoto helps you in recharging you phone through the VTU method but in a super fast and safe way. You need not worry about your ATM card information entered on zoto, as you can be rest assured that it is secured and kept safe. Zoto safe your card from your first transaction so as to enable make further transactions without having to type your card number. 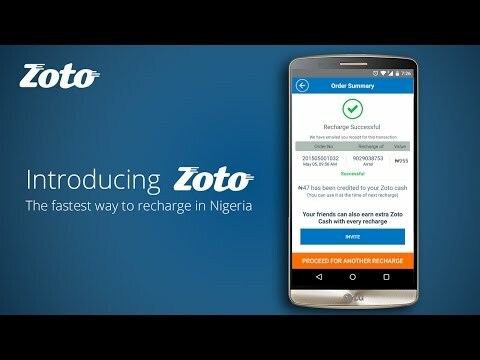 More than 50,000 Nigerians already using zoto to recharge and get cashback everyday as new promo code rolls out weekly. 1. Get cash back up to 50% of your recharge once per day. 4. Recharge your DSTV, GOTV, Startimes and other digital television service at the fastest speed and reduced cost. Why Should I Install And Use Zoto? I recommend that you make use of the zoto app as all transactions take less than 2 Mins with your bank ATM and less than 30 Secs with the zoto wallet. It is safe as no one can access the app on your phone without knowing your 4 digit personal security pin. You can make free recharge cash from ZOTO via the ZOTO referral program. 2. Open the ZOTO app, register and use a 4 digit password that you can remember. 3. During the registration, tick I have a referral then input JONAHS19 as your refferal. 6. You will be asked to provide your ATM card details (the card number in front of your card). ZOTO is safe and secure, be rest assured your card is in safe hands. Note - OTP will be sent to your bank registered mobile number by your bank for confirmation, you will need the OTP make any transaction. 7. Input the OTP you received on the ZOTO app transaction page and your mobile line will be credited within 30 seconds. 8. There after your first recharge, you will be given N500 bonus in your ZOTO wallet. Now start making use of your referral code to invite people to join ZOTO, you get N700 for each recharge. awesome and truly excellent material for visitors.